“Leader of pro-Israel group.” So as far as the Washington Post is concerned, if you head a human rights organization dedicated to the freedom of speech, the freedom of conscience and equality for all before the law, then you are the leader of a pro-Israel group. The leader of a controversial pro-Israel group that was blocked in its effort to place ads featuring a cartoon of the prophet Muhammad in Metro stations has filed suit against the transit agency, saying that the Washington Metropolitan Area Transit Authority has violated the group’s First Amendment rights by refusing to display the ads. “This case seeks to protect and vindicate fundamental constitutional rights,” the suit states. In May, Pamela Geller, the co-founder and president of the American Freedom Defense Initiative, sought to take out a series of ads featuring the winning entry from a “Draw prophet Muhammad” cartoon contest it had sponsored in May. 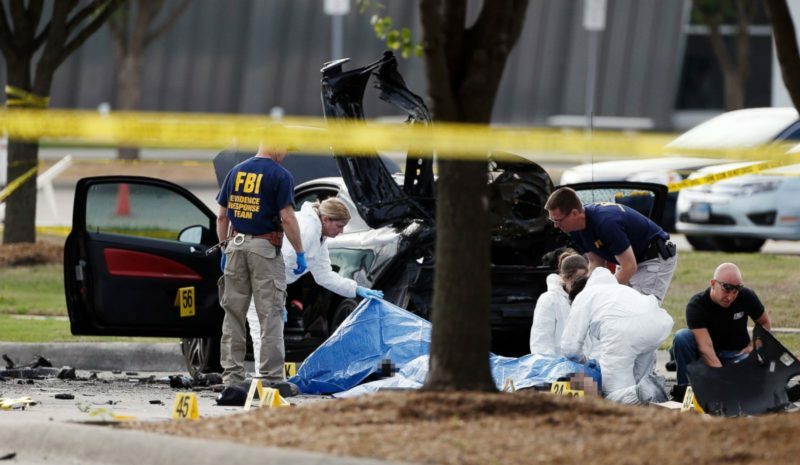 That contest drew national attention after two men, Nadir Hamid Soofi and Elton Simpson, opened fire with semiautomatic rifles outside the building in the Dallas suburb where the May 3 event was held. Both were shot and killed by a police officer. A security guard suffered a leg wound, but no one else was injured. But rather than display the ads, in June Metro’s board voted to ban all new advocacy ads for the rest of the year. “As one of my readers pointed out, no contemporary medium of communication may pass the test of being merely commercial and non-political,” she added. “The New York Times runs an editorial page every day — not to mention the slant of their ‘straight news’ — and therefore, if they can advertise, so can the Village Voice, the Socialist Militant, and Dabiq (ISIS’s four-color magazine), for that matter. News of the suit was first reported by Washington City Paper. Metro officials said they do not comment on pending litigation. Officials with New York’s Metropolitan Transportation Authority adopted a similar policy in May. The transit agency had rejected one of the ads Geller’s group sought to display out of concern it could lead to violence. Geller sued and a federal judge ruled in April that the MTA would have to display the ad. Instead of complying, the board voted to ban all political advertising in the system. Metro has had a mixed history with Geller’s group. In September 2012, AFDI bought ad space in four Metro stations for the message, “In Any War Between the Civilized Man and the Savage, Support the Civilized Man. Support Israel. Defeat Jihad.” AFDI sued after Metro sought to delay displaying the ads because of unrest in the Middle East, but a judge ordered the ads to be posted. Last year, when AFDI bought space on Metro buses for ads linking Islam to Nazism, the transit agency quietly accepted the advertisements. This time around, however, officials reconsidered. Lynn Bowersox, Metro’s marketing manager, said revenue from issue-oriented ads accounts for about 20 percent, or roughly $2.5 million, of the agency’s overall annual income from advertising. Advocacy ads, if they had been allowed to continue, would have brought in about $1 million in the remaining seven months of this year, she said. Metro officials said the board could vote to make the ban on issue-related ads permanent or extend it into 2016, a presidential election year, when demand for campaign ad space would be exceptionally high.